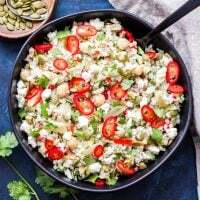 This Andalucían Cauliflower Rice Salad Bowl is a low carb, grain-free version of the traditional Spanish rice salad. Full of healthy fats, salty, briny flavors and no cooking required! You guys, I’m pretty sure I have a slight obsession with cauliflower rice. My husband would argue that it’s more than “slight”. He makes fun of me that at any given time there are at least four bags of cauliflower rice in the freezer and sometimes more. I used to make my own, but then I realized how much time I was saving just buying the frozen pre-chopped stuff. Not to mention the cost difference really isn’t that much more when you factor in how much of the stalk and leaves are tossed out. 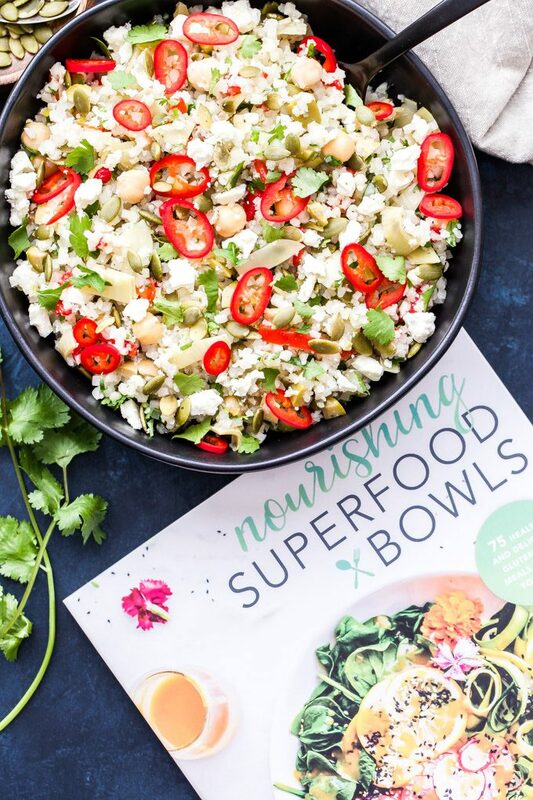 It should come as no surprise that when my copy of Lindsay Cotter’s cookbook Nourishing Superfood Bowls arrived at my door, I was immediately drawn to the recipe for the Andalucían Cauliflower Rice Salad Bowl. Don’t get me wrong, I was blown away by all of the recipes in this book. 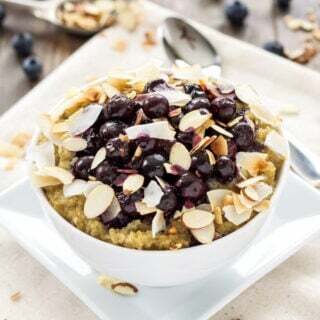 There’s everything from sweet and savory breakfast bowls, lunch bowls, plant based bowls, large family-style bowls and even dessert bowls! They pretty much all left me with my mouth hanging open and my stomach growling. If you aren’t familiar with Lindsay Cotter or her blog, Cotter Crunch, I highly recommend checking her out. I’ve been following Lindsay for several years and am always drawn to her recipes because of all the wholesome, nutritious, vibrant colored meals she makes. All of her recipes, both in this cookbook and on her blog are gluten-free and many of them have vegan, paleo and grain-free options as well. If you suffer from any food allergies or are just looking to rework your diet and add in more superfoods and wholesome ingredients, she’s your source to go to. 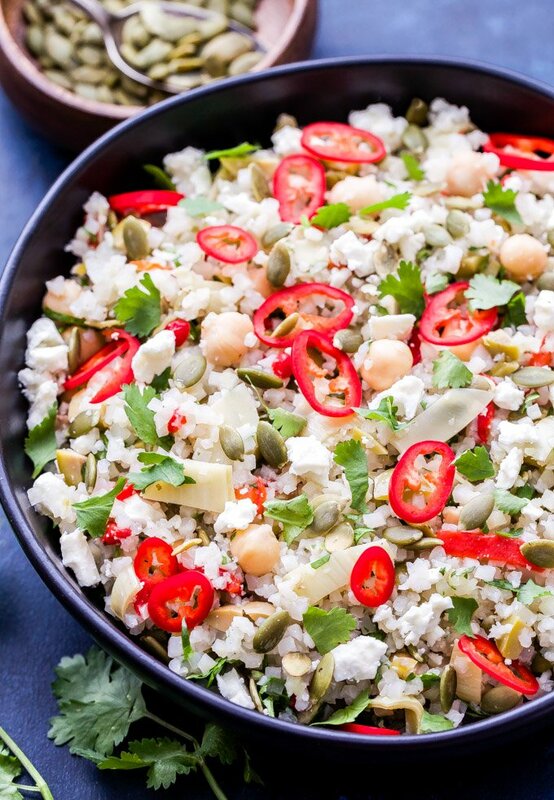 Everything in this Andalucían Cauliflower Rice Salad Bowl speaks my food love language. Besides the cauliflower there’s also green olives, marinated artichokes, pimentos, jalapeños, feta cheese, pepitas and cilantro. So much salty, briny flavor, I could hardly stop myself from eating it all in one day! 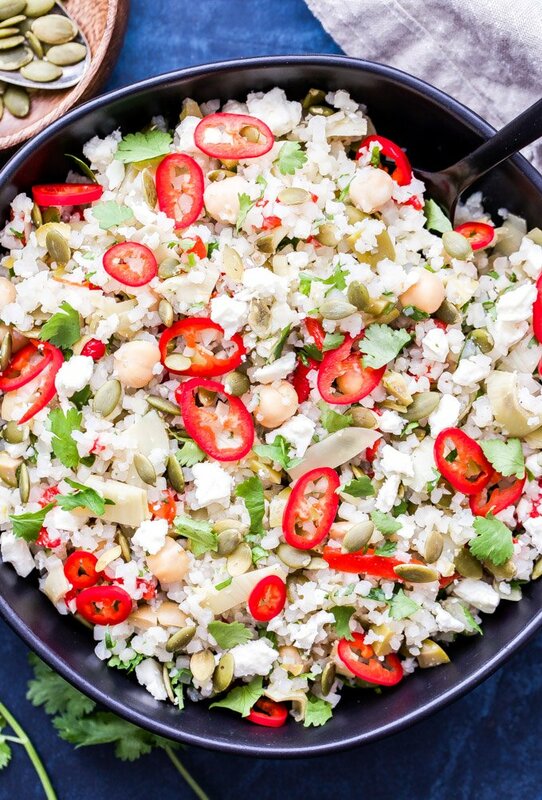 To save time making this salad, I used a bag of frozen cauliflower rice (since my freezer is so well stocked with it) and defrosted it in the microwave. If you go that route, the salad will literally take you 10 minutes to make from start to finish. To make it a main dish salad I added in chickpeas, but chicken would be delicious too. Grab a copy of Nourishing Superfood Bowls so you can not only make this salad, but all the other amazing recipes as well! Cut the cauliflower head into 3 to 4 parts. 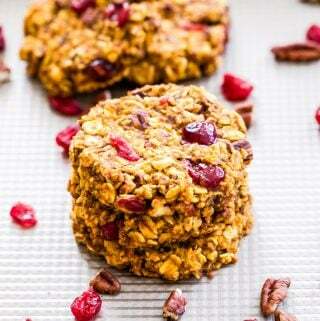 Working in batches, process in a blender or food processor until a riced texture is achieved. Place in a large bowl. 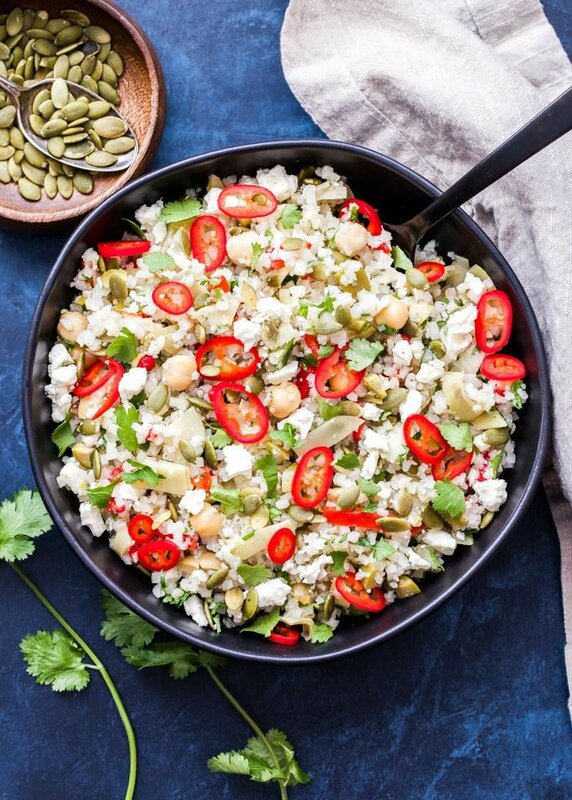 Toss the rice with the pimentos, green olives, artichoke hearts, pepitas, cilantro, salt, pepper and garlic powder. Let the mixture sit in the fridge and marinate for about 10-20 minutes, to enhance the flavor, or serve immediately. Top with the cilantro, jalapeño and feta cheese. Drizzle with olive oil and red wine vinegar. Taste for seasoning and serve. To save time, I used a 12 ounce bag of frozen cauliflower rice and defrosted it in the microwave. 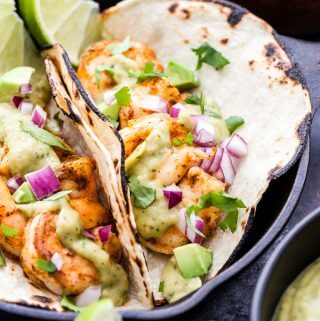 To add protein, toss in cooked chickpeas, chicken, shrimp or black beans.